Quilting-land at my house has been taken over by babies at my house. Just the way I like it. 🙂 The first baby quilt is for a little boy, newly arrived. I decided to do large disappearing nine-patch blocks. 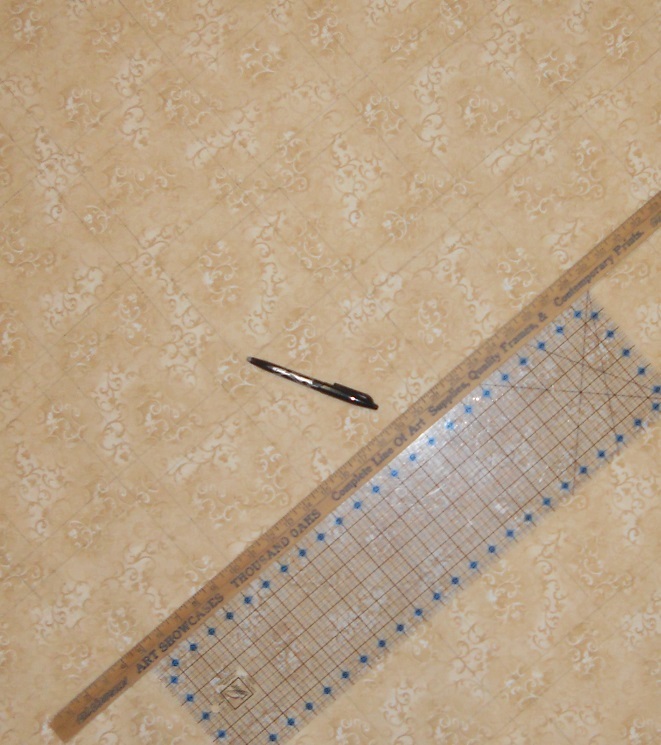 The first photo is what it looked like before the nine-patches were cut apart and rearranged. Here it is, all together. It’s a little wrinkly, fresh from the dryer. 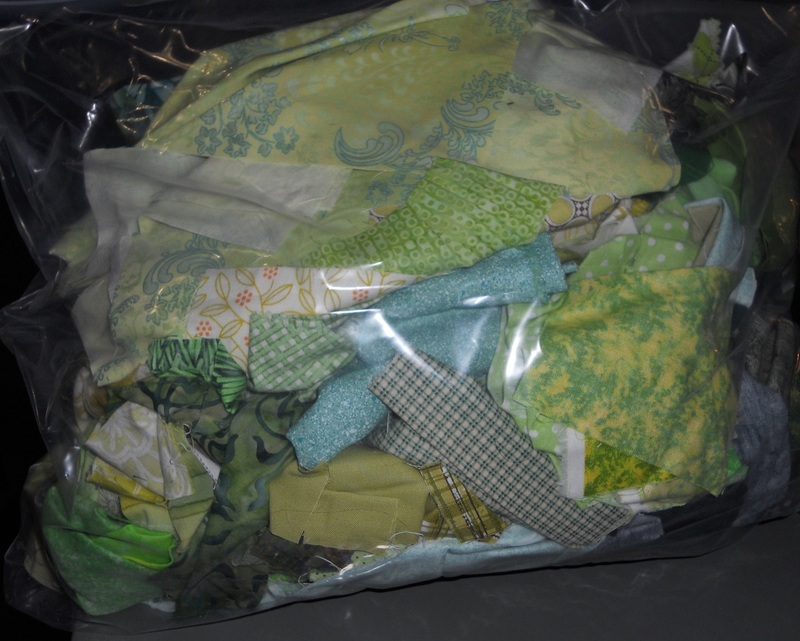 I wash all of the baby quilts I make before mailing them out. Why? Because I spray baste, which leaves a bit of the glue residue inside the quilt until the first wash. I wouldn’t want a baby sucking on that. Lastly, the fold-over shot. Isn’t this backing super cute? It’s a flannel, so it’s super-soft. The second quilt is for a baby who isn’t here yet. 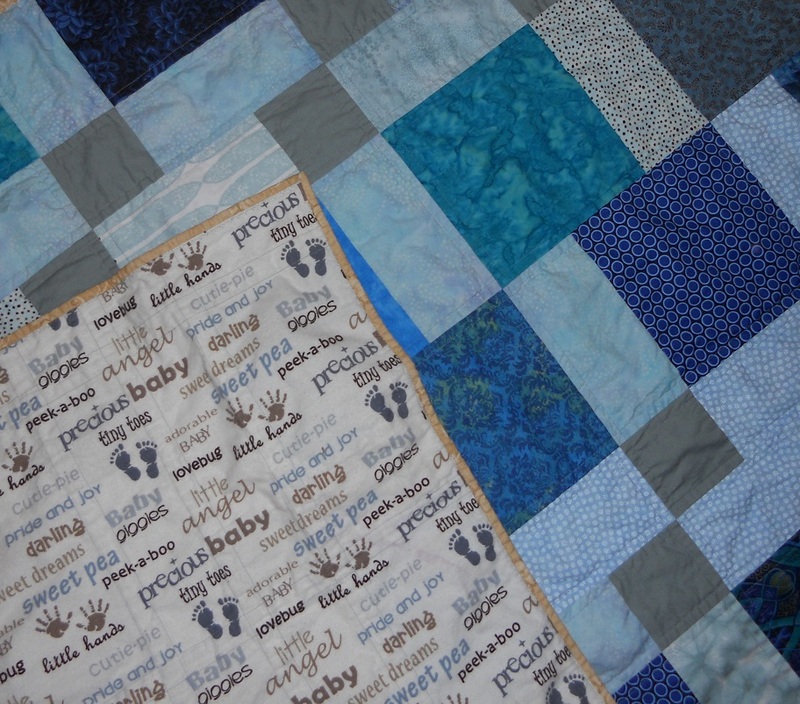 We don’t know if this baby is a he or a she, so my customer asked for a gender-neutral animal quilt. She pictured mom and baby looking at the quilt and talking about animal sounds. 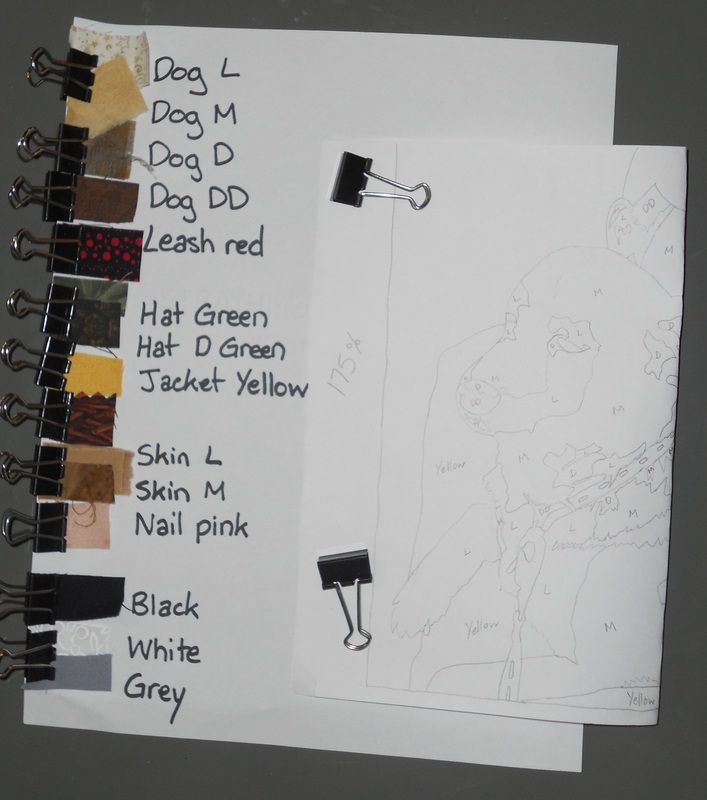 I piled up the animal fabrics and started designing. I ended up going with my third or fourth idea for this quilt. See, I could piece all these animal fabrics together and come up with a big zoo for the kiddo to explore. But I kept coming back to the customer’s vision that included animal sounds. I had 34 animals which included rabbits, hedgehogs, penguins, and crocodiles. Pared down to the ones that make recognizable, kid-friendly noises, I was left with 17 blocks. 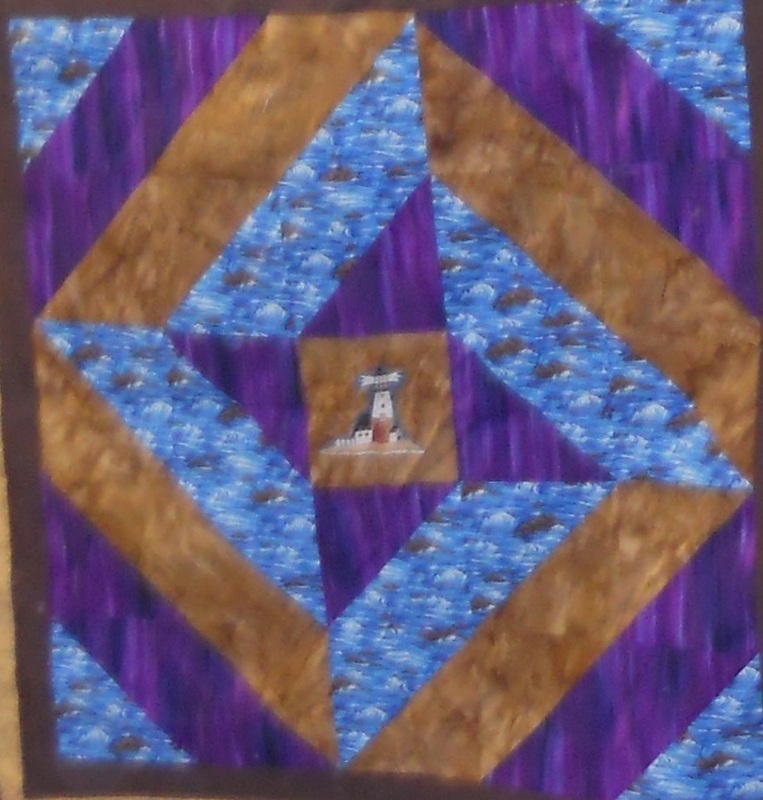 I decided to make this quilt have a lot of negative space between the blocks. A subtle fabric, lots of space to breathe, not too busy. 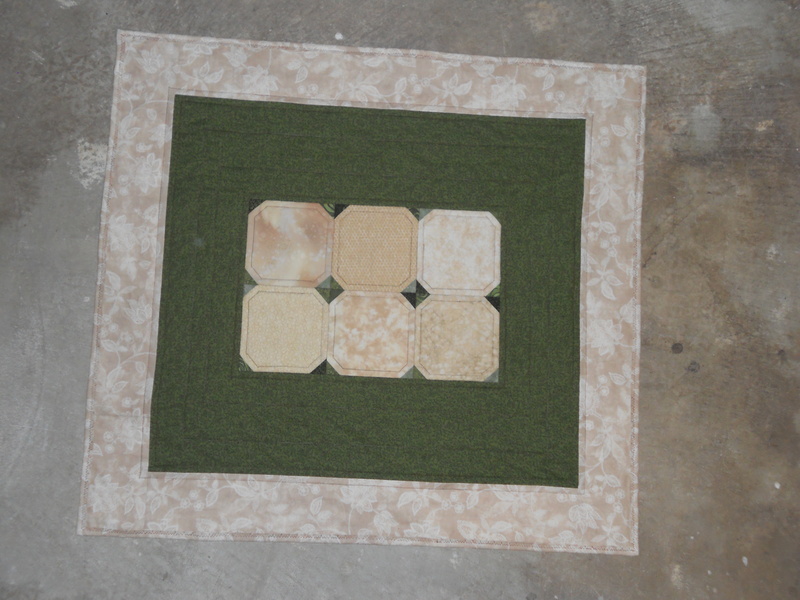 Rather than piecing the top, I sandwiched and quilted it whole cloth. 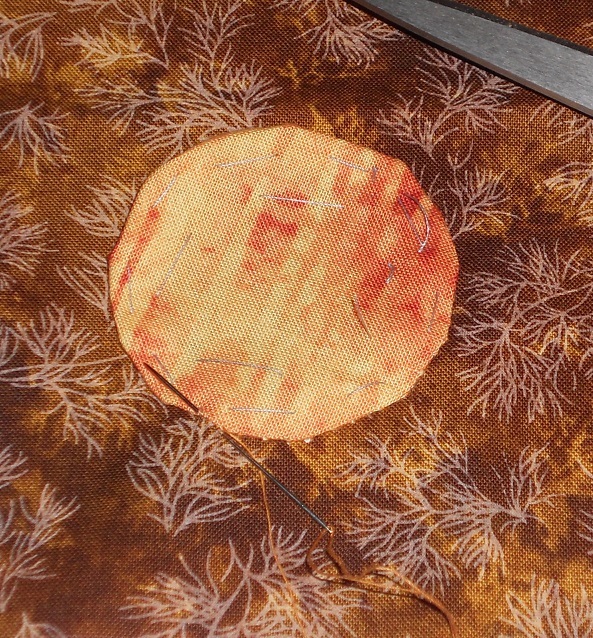 I marked the quilting lines with a Frixion pen, which comes right out in the wash along with the spray baste. Then I added the animals to the quilt. 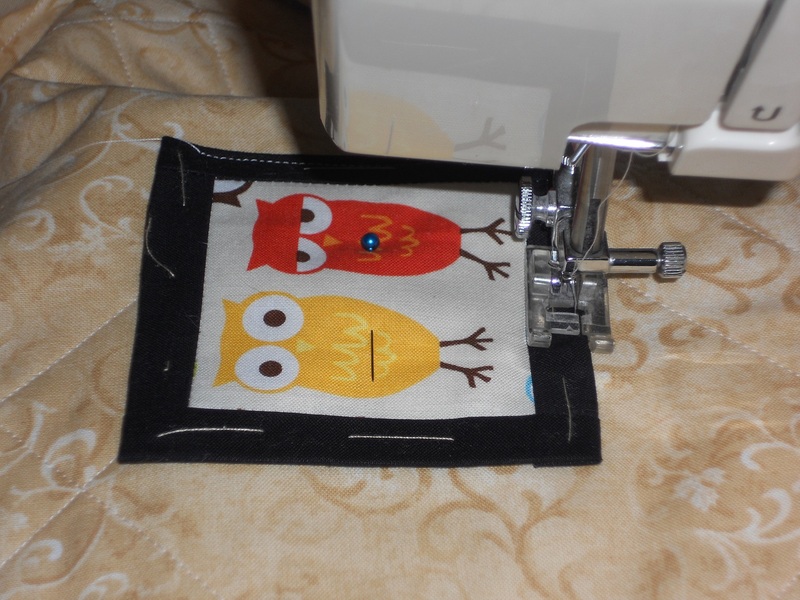 First I framed each in black fabric, then I sewed each down to the quilt. So instead of being appliqued to the background fabric, they are actually quilted on top of everything. 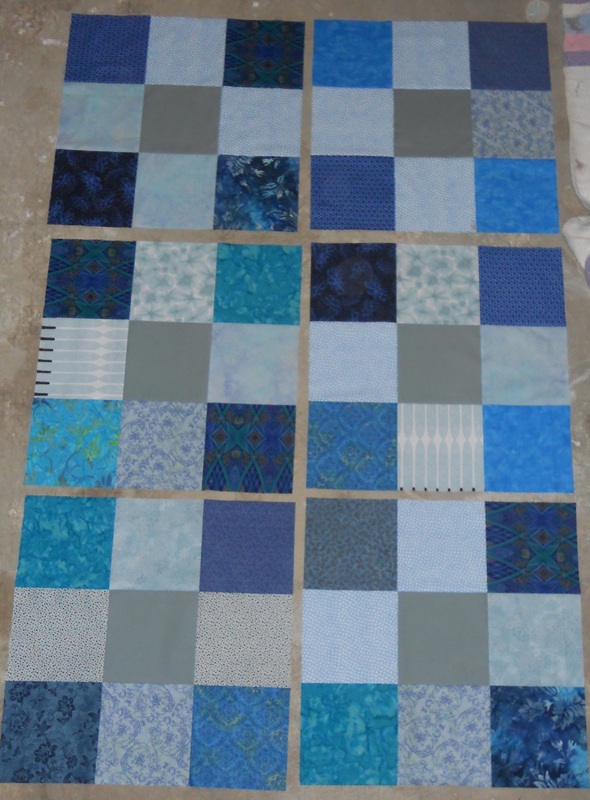 Here’s what the blocks look like all laid out and pinned in place. It’s a little bit like a photograph wall. I bound this one in the background fabric and sent it on its way… before getting the all-important fold-over shot. 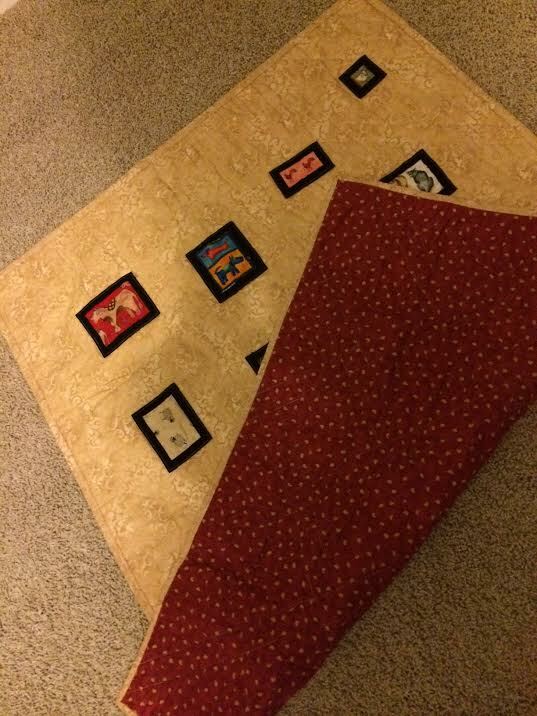 Luckily, my customer sent me this picture when the quilt arrived safely at her house. Red fabric with chicks on it for the backing! Now for a bit of hand-applique. This will be the final border on a round-robin piece for my quilt guild next week. I’m excited to show you guys what my quilt looks like! I haven’t seen it for a few months as other quilters have been passing it around and working on it. This entry was posted in Applique, Art, Artist's Studio, Binding, Collaborations, Custom Work, Quilting the Quilt and tagged animal quilt, animal sounds, animals, baby boy, baby quilts, custom quilts, customer's vision, D9P, designing, disappearing nine patch, gender neutral, hand applique, negative space, nine patch, QUILTArtbymegan, quilting, round robin on May 10, 2014 by quiltartbymegan. I’ve participated in four round robins, three of which were by mail with people I only knew from an online quilting group. 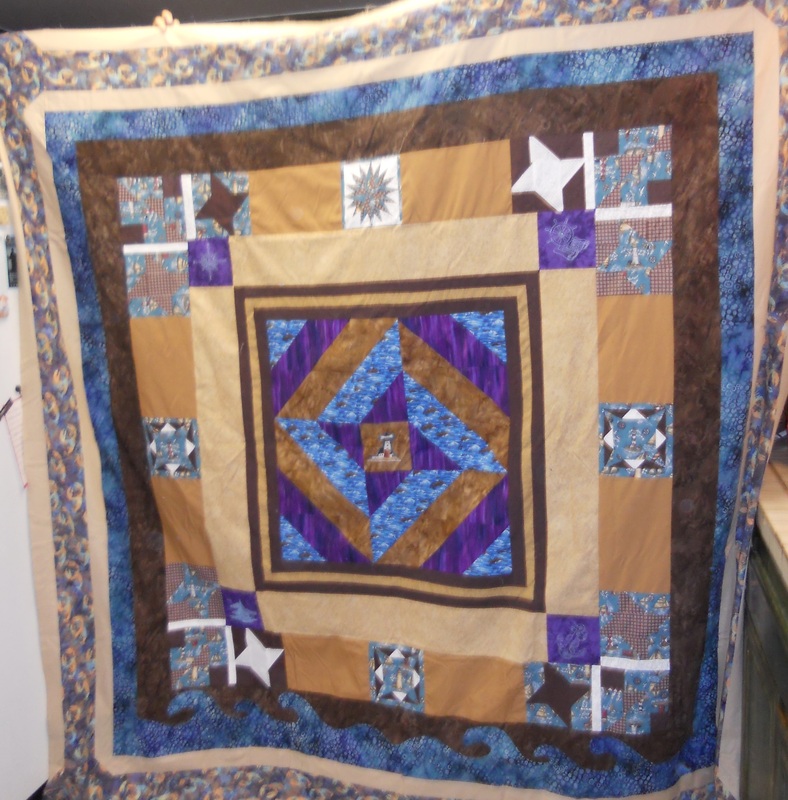 The other was through my local quilting guild. Two of those were donated to charity and the other two are so gorgeous that I haven’t started quilting them yet. I just look at ’em and drool. Here’s what I’ve learned. And here’s the quilt top that came back to me. I call this an amazing success. Okay. Here’s the other part of the round robin. And really, it’s the part you’ll be spending most of your time on. You make your center and send it off to make the rounds through other quilters’ hands and hearts but don’t really get to see it again for several months. So let it go! While it’s gone, you’ll be working on others’ centers. This can be very fun and stretching. 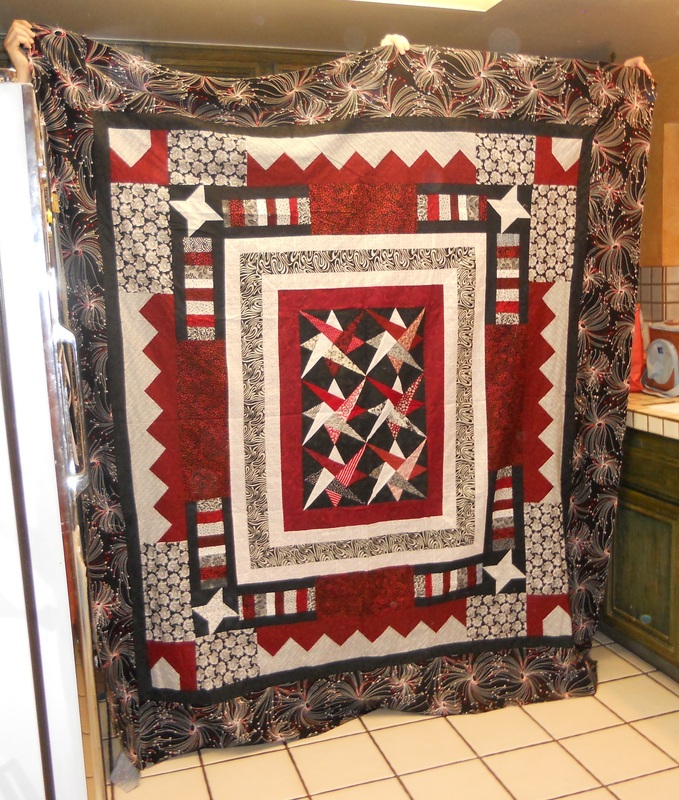 The red/white/black quilt was in a group of six. 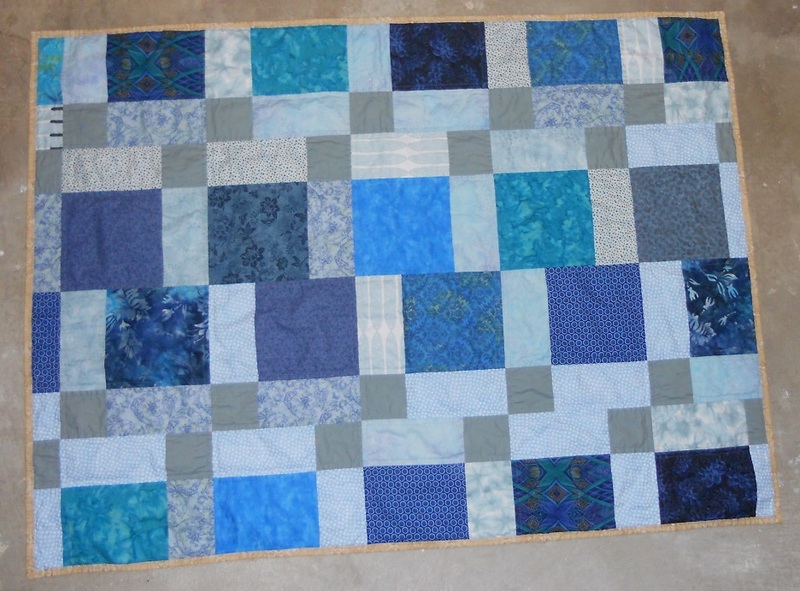 So I worked on five other quilters’ projects, one border at a time. I learned a lot about when symmetry’s important (or not), new border techniques, when a quilt needs some rest (two busy prints next to each-other look a mess), and how to work on something that isn’t my style. As in-awe of these two quilts as I am, I think the real reason to do a round-robin isn’t for the quilt you get back. It’s for the experience of connecting with other quilters as you work on their projects. It’s an intimate thing, adding your art to someone else’s. I’m a big believer in collaborative projects. This entry was posted in Applique, Art, Artist's Studio, Collaborations, Inspiration, Swaps and tagged be specific, black, centers, choosing colors, collaborations, collaborative, gift, group quilt, guild projects, lighthouse, man quilt, plan the quilt, quilting, quilts, red, round robin, round robins, rwb quilt, sew, sewing, stretching, swaps, white on November 9, 2013 by quiltartbymegan.